I didn’t know what Medjool dates were until I started making these power snack balls. Maybe I didn’t get my hands on because they didn’t look that attractive at the shops. They are soft, sticky and sweet, great for making healthy raw desserts. Dates give extra energy to a tired body within half an hour after taking it. 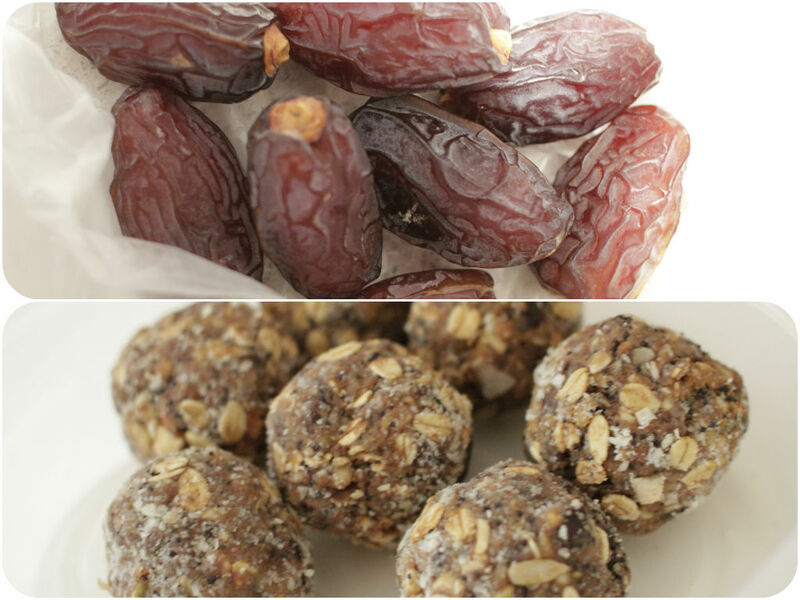 So having powder date balls will boost your stamina before exercise and keep your energy levels between meals. They contain minerals and vitamins – oil, calcium, sulfur, iron, potassium, phosphorous, manganese, copper and magnesium which are advantageous for health. They also help in fighting constipation due to high dietary fibre content, intestinal disorders, heart problems, diarrhea and abdominal cancer. Apparently Muslims break their fast by eating dates and water according to their traditions. Breaking fast with eating dates helps to avoid overeating of the food after the fast because the feeling of hunger gets pacified. So you can see eating dates helps to control your hunger here. How to use them? Medjool dates taste incredibly sweet and caramel-like. My favorite way of using them is in baking and making sweets. They definitely help to satisfy your sweet tooth without any refined sugar. You can eat them just by itself as a snack on the go. They don’t need refrigeration and stand up well to travel. It is originally grown in Morocco, so goes well with Moroccan spices like cumin, cardamom, turmeric and saffron. Put them in savoury dishes like couscous salads, stuffing, tagine, casserole, etc. It will add a beautiful natural sweetness to the dishes. 50g mixed nuts (almonds, walnuts, cashews) – Feel free to use any types of nuts that you have on hand. Add all ingredients to a food processor and pulse until completely combined. Pour the mixture into a bowl. Roll them into balls until all the mixture has been used. Add a bit of water if the mixture is too dry or add more almond meal if too wet. You will need to squish it together so that it sticks. Damp hands can help the rolling process. Refrigerate them in an airtight container until needed.